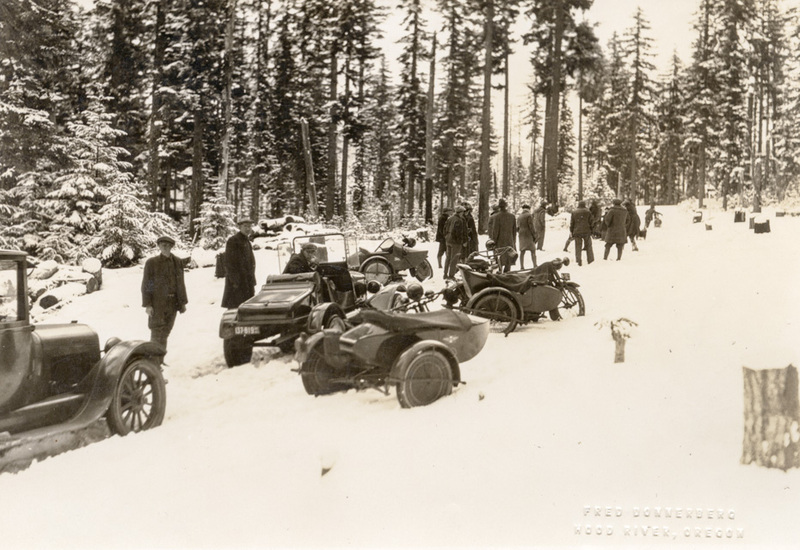 Members of the Hood River Ski Club arrive for an event circa 1922. I wonder how a motorcycle with a sidecar handles in the snow compared to a Model T. I guess the other obvious question is, "Where are their skis?" The photo is by Fred Donnerberg. Has the Homestead Inn been mentioned here before? Sounds like an interesting place. Some history? These look like the prelude to the snowmobile. Yes, we have had photos of Homestead Inn, I think. I know we have talked about it. It was located near Cooper Spur Ski area, but one has to know exactly where to look for it. Right Bill Pattison. Such a fond memory!!!!!!!! Not much traction on a T with the narrow tires, but I would have thought impossible on a cycle with one wheel powered and the drag of a sidecar.. I remember Kate showing us the location/footings of the water/observation tower that shows in Homestead photos. The author of "I know Homestead Inn" is our Charlott. If the book on Homestead Inn by Charlotte is available I would like to purchase a copy. If not I would come to Hood River to read a copy in the library if available. Great area, great history..